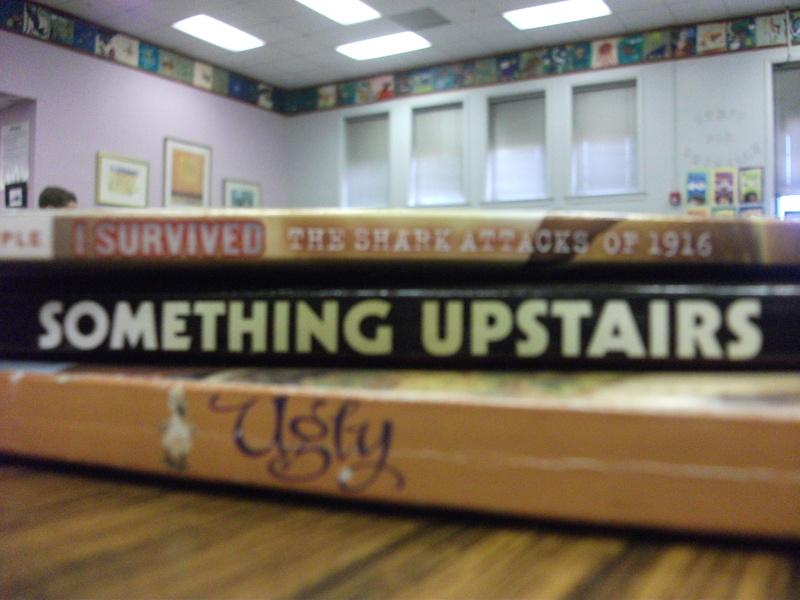 Two classes have come to the media center so far to create book spine poetry. I got this idea last year after reading the 100 Scope Notes blog. To make a book spine poem, you arrange a stack of books so that the titles create a poem. Each title of a book becomes a line in the poem. In my lessons, we’ve done some examples together and listened to past examples from classes. Students get in groups of 3 and wander around the media center browsing the shelves for interesting titles that seem to fit together. Once they make their decisions on 3-5 books, they pull the books off the shelf and arrange them in a stack. Stacks of books go to tables and a teacher helps students take a picture of their stack. Next students bring the camera to a computer where another volunteer helps them download the picture into a class file. Students then find a space to practice reading their poem aloud. Once ready, students come to me and use Photo Story 3 to record themselves reading their poem. When students finish checking out, they sit on the carpet to hear their final product. Enjoy listening to one of the book spine poems here. This entry was posted in Poetry Month and tagged book spine poetry, poetry.